Pour all of your liquid ingredients into a shaker and give it a good shake, then let it settle for about thirty seconds. Strain everything into two martini glasses. Add a candy cane, for garnishment, into each glass. Just a little something to warm your spirits in this cold season. 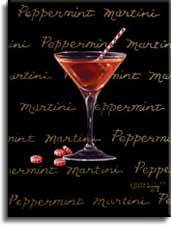 The chocolate peppermint martini is guaranteed to add some joy to your holiday. I would prefer mine slightly warmed, but feel free to enjoy it chilled. One thing is for sure, after a couple of these, even Ebenezer would find the Christmas Spirit. He would also, probably, then walk down the street without any pants, singing Christmas carols. Enjoy! Also, If you have any sense of self worth, run out right now and pick up a case of Samuel Adams Winter Mix. Enjoy a selection of truly full bodied beers that warm both the body and the spirit. Best if shared with friends.